I was so looking forward to this coloring book that I also purchased the version printed in Thailand. While I like things about both versions, for me, the US version is the clear winner. Why? Simply put it has more designs to color. I’ll go into some of the differences at toward the end of this review. The Night Voyage is the story of a young girl and her cat, Phoebe, who go on a night adventure giving away presents to others. Or did they? That is the question left unanswered at the end of this story. The coloring book is filled with Daria Song’s beautiful artwork and imaginative design concepts. From paper crane airplanes to old-fashioned bicycles to gorgeous air balloons, each page is a wonderful opportunity to color. This is what I experienced while coloring in this book and testing the page with my coloring medium. In the comments section below, I will list the coloring medium I use for testing and coloring. Separate dust cover which has coloring opportunities on the inside and an attached cover which can be colored as well. Water-based markers, gel pens and India ink pens do not bleed through and do not leave shadows on the back of the page. Some gel pens require additional drying time. Colored pencils worked very well with this paper. I tested oil and wax based pencils. I was able to get good pigment lay down with both types. Layering the same color for deeper color, multiple colors and blending with a blending stick worked well and easily. Both versions have their advantages. The Thailand version was printed on a slightly off white when compared to the US one (thought I originally thought of it was simply white.) It also had colored images and colored cards included with some single page versions of designs which were on two-pages spreads. You can see my review and video of this version from May of this year on Amazon under the name The Present by Daria Song. For me, the US version was the better of the two but I am happy that I have both. The US version is printed on bright white paper that was able to take all but alcohol-based markers without showing through. There are many pages of designs not included in the Thailand version at all. The detached dust cover, which is different from the original two books by Ms. Song, was a nice new touch with coloring opportunities as well. While the books are approximately the same size and the US version actually has less pages overall, it weighs more which leads me to believe that the paper is thicker. The Pop culture fashion of the 1960’s is the theme for this Vogue coloring book. Iain R. Webb is the illustrator for this book as he was for the prior Vogue coloring book. He does a lovely job of interpreting the actual fashions of the time into line drawings. Along with each fashion is a particulars of the fashion, the designer as well as odd bits of info (such as how it could be ordered, etc.) This information is generally off to the side of one of the fashion designs. The designs range from fairly simple lines to highly detailed with small intricate parts to color. The fashions of the 1960’s showed a jump from the cute matching outfits with gloves to wild colored mini-skirts and men’s ware for women all the way to the hippie-inspired caftans that were popular as the decade wound to an end. A number of the models have a Twiggy quality to them, with thin almost young boy figures with eyes with heavy fake eyelashes. While my preferences in fashion coloring books are from the decades before the pop culture period, I appreciate the fashions that I recall seeing when I was a little girl. As an adult, I now appreciate how the fashions of this period reflected the social changes which were occurring at the time. Women were becoming more free to express themselves and to show the expression in how they dressed. The one issue I had with the prior book is much better in this one. I did not like the squiggly lines that were placed on the models mouths as I prefer to color the lips in my coloring projects my own way. The few that do appear have more of a highlight look to them rather than the caterpillar look I found in the first book. This is what I found as I colored in this book and tested the paper with my coloring medium. In the comments section below, I will list the coloring medium I used for testing and for coloring. Coloring book can be opened to fairly flat for coloring by breaking the spine with some effort. Water-based markers, gel pens, and India ink pens do not bleed through and did not leave shadows on the back of the page. Colored pencils worked well for the most part. I could get good pigment color and layer the same or multiple colors easily. Blending with a blending stick sometimes resulted in a slightly smeary look rather than a clean blend. Using a liquid blender worked better for me. I tested both oil and wax based pencils with similar results. Letters to Live By is a Christian coloring book which goes through the alphabet A to Z with a design for each letter and a design which focuses on a word beginning with that letter and which has a Bible verse and cite(both Old and New Testament.) The ten additional pages at the back include small monogram size letter designs and several postcard size designs as well. While the designs are licensed by Shutterstock, they are all new to me. The designs are detailed without being too intricate. I think it is a lovely book and one that I will be buying as gifts for family and friends this holiday season as well as enjoying for myself right now. I plan on opening the book to a random page and then coloring both the letter designs and the associated page in tandem. I like to feel that I am being led to the pages that I need at a particular time when I am working with my Christian coloring books. There is always something I need to learn or to be reminded of on a daily basis. The scripture translations used in this coloring book are as follows: Holy Bible, New Living Translation, Holy Bible, New International Version NIV, Holy Bible, English Standard Version, Holy Bible, Contemporary English Version, and the New King James Version. This is what I have found while coloring in this book and testing my coloring medium on the paper. I will include a list of my coloring medium that I use for testing and coloring in the comments section below. Some Designs merge past the perforations and into the binding area. Nothing essential to the designs are lost into the binding. Book can be opened fairly flat for coloring if you break the spine with some force. Alcohol-based markers bleed through the page. I suggest either removing these pages from the book before coloring or using a blotter page under your working page. I use card stock but a couple pages of heavyweight paper work well, too. Water-based markers, gel pens, and India Ink pens do not bleed through the page. Some gel pens require additional drying time. Colored pencils work well with this paper. I got good results with both oil and wax based pencils. I found that I could get good pigment, layer the same or multiple colors and blend easily using a pencil style blending stick. This is a really fun coloring book for anyone who likes to solve puzzles or mazes. There are 15 two-page maze designs which detailed and intricate elements to color. I’ve often worked puzzles with this style of tiny detail and have worked a few mazes so this coloring book is one that appeals to me on a variety of my hobbies. The point of the book is to find the person to guide through the maze. You color that person blue and the end point in red. You can color on your way or go back after solving the maze and color the page. My plan is to color the pages after I solve a maze one at a time. The only thing I wish I could change about these mazes are the big blurb boxes which show the starting point. For a regular maze, this may make sense. For a coloring book, I wish that they had put a simple small circle (pencil eraser size) near the starting point or simply pre-colored the person you are to guide. That way, the entire maze is available to color and does not have a big instruction box (some approximately 4 x 3 inches) blocking parts of it. Just a thought for any future publications of this sort. Paper is heavyweight, white with green borders, slightly smooth and non-perforated. Designs merge into the binding. My book is extremely well lined up with no loss of elements into the binding area. The book opens fairly easily to a flat position for coloring. Alcohol-based markers bleed through the pages. I don’t recommend this medium for this book as they will bleed through and mar the designs on the back of the page. Water-based markers, gel pens, and India ink pens did not bleed through or leave any form of shadows on the back of the page. Some gel pens required additional drying time. Colored pencils work well with this paper. I was able to get good pigment, layer the same or multiple colors, and blend easily with a blender stick. Because of the extreme detail in this coloring book, I don’t recommend it do anyone who has vision or fine motor skill issues. Deck the Halls is the one of the two holiday coloring books by Designs Originals this year. The other book is called Merry and Bright Both books are collections from a variety of artists who publish books from Designs Originals. The designs are fun and festive and have a focus mostly on Christmas but there are a few that are holiday season generic. The designs range from chalk-style (with black backgrounds) to detailed and intricate to the fun and funky designs of Thaneeya McArdle. While the designs in the book seem to have been included in prior or future publications from the single artists, it appears that there are no duplications between the two collaborative books. Something different about these books are that there are no full size color sample pages though the back inside cover has nine small colored samples. I think this helps keep the book so affordable. While I own a number of the books that these are pulled from, a huge plus for me is that this book contains the full size version of some of the pages which are provided in medium size in the original books. I really dislike the smaller design pages and am happy to get these designs in a more easy to color size in this book. It has actually convinced me to buy at least one other book as I won’t be missing out on larger designs since they are included in these two. The artists in Deck the Halls include: Thaneeya McArdle, Robin Pickens, Angelea Van Dam, Valerie McKeehan and Jenny Newland. This is what I experienced while coloring in this book and testing the paper with my coloring medium. In the comments section below, I will list the coloring medium I use for testing and coloring. Gel pens and India ink pens leave shadows on the back of the page and can spot through as well depending on how heavily they are applied. Colored pencils work well with the paper. Both oil and wax based pencils provide good color, layer the same or multiple colors well, and blend easily using a blending stick. Hard lead pencils can dent through the page. I like to use a blotter page below my working page to keep seeping ink and dents from marring the pages below. I use card stock but two sheets of heavyweight paper work well, too. You can also simply remove pages before coloring to keep the rest of the book in good condition as well. Merry and Bright is the one of the two holiday coloring books by Designs Originals this year. Both books are collections from a variety of artists who publish books from Designs Originals. The artists include: Thaneeya McArdle, Angelea Van Dam, Robin Pickens, Valerie McKeehan, William Vanderdasson and Jenny Newland. Most (if not all) of the designs seem to have been published in each artist’s own holiday books in the past or those about to be published. I own a few of those books but have no problems with the duplication of the designs, especially as this great holiday coloring book is very affordable. Some of the designs are full size compared to medium size in their original books so I am pleased with that change. The designs are a really nice mix with lots of Christmas and holiday spirit. They range from cute line drawings to chalk-board style designs to detailed and intricate designs. It gives the colorist a really diverse group of designs to choose from and a good number of artists to try. This is what I found while coloring in this book and testing the paper with my coloring medium. In the comments section below, I will list the coloring medium I use for testing and coloring. I use a blotter page of card stock or heavyweight paper (two sheets0 to keep seeping ink and dents from marring the pages below. I recommend using a blotter or that you remove pages before coloring. This is another beautiful coloring book by Christian Art Publishers. The book is filled with 58 lovely designs (licensed by Shutterstock) with verses (and cites) from the Book of Proverbs. This is the book I look to for day to day lessons on what is expected from each of us. Sometimes the lesson is easy and sometimes it is hard to take. But it is always right. The book is very well made and has many of the points that I look for in coloring books. While the images are licensed, they have been reworked to be used with the Bible quotes. Out of the 58 designs, only one is familiar to me as one that I have colored previously. There are 58 large designs plus 11 bookmark and card sizes, too. While the pages are perforated, you will have to cut the bookmark/cards out of the page in order to use for their intended purpose. There are no cutting lines. The Bible translations used for the verses are: Holy Bible, New International Version NIV, Holy Bible, New Living Translation, Holy Bible, Contemporary English Version, and Holy Bible, English Standard Version. Some Designs merge past the perforations and into the binding area. If you remove designs at the perforations, you will not lose elements essential to the designs. Book can be opened fairly flat for coloring but you must use a lot of pressure to break the spine. Alcohol-based markers bleed through the page. I suggest use of a blotter page if you use this type of marker. It will keep ink from seeping through to the design below. I use card stock as my blotter but a couple of pages of heavyweight paper work well, too. Of course, you can always remove your pages from the book prior to coloring. Colored pencils work well with this paper. Though it is somewhat smooth, it still has enough tooth for good pigment, layering, and blending. I tested both oil and wax based pencils with good results. This is a cute and different type of amigurumi. 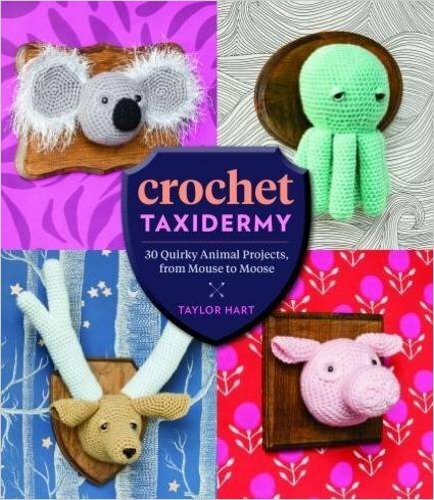 Rather than crocheting a whole animal, the idea is to crochet just its head and mount it on a block of wood. It is a humorous take on taxidermy. While I would not have an animal head mounted in my house for a variety of reasons (not least of all is the wall space), I would be happy to make some of these to place in spots (such as the powder room) or to make as gifts for others. I enjoy Thaneeya McArdle’s designs and have bought almost all of her coloring books. I really appreciate the designs in this book; however, the new publishing format is something I really don’t like. There are 32 Sugar Skull designs in the book and they are very well drawn and the larger images are quite fun to color. The ten smaller designs are very difficult to color and require ultra-fine pens and markers or very sharp pencils and a steady hand to finish. Until now, I have not dropped star ratings on Design Originals books due to the format; however, as more of the pictures in this book were needlessly sized down and because it made already detailed images very difficult to color, I am giving this book a 3.5. The designs are 5 star and impressive. The publishing format is 2 stars (as still 2/3 of the book is printed well I cannot rate it 1 star.) The average is 3.5 and I round up as I cannot leave that rating on Amazon, on their platform it shows as a 4. In this particular book, a full ten of the designs have been sized down to allow for coloring tips, etc. on the coloring page. The end result is that the designs have extremely small and difficult to color spots. While the designs are detailed, it would not have been difficult to color this book if the designs had been printed full size. If you have any issues with fine motor skills or vision, I think this book may not be for you as almost one third of it is so difficult to color. In the new coloring books from Design Originals (started about mid-2016), they altered their format and the designs which are shown as colored samples in the book are no longer provided in full page format. They are included as medium designs with a thumbnail of the color sample, a few samples of the colors used and a quick sentence or two about the how the colors work with the design. These sized down designs range from 8 to 10 pages depending on the book. I really dislike the change. I want the pages in full size for both ease of coloring and for consistency with the other pages in the book. The shrinking of the designs has made some of the details small and intricate and difficult to color. I wish they would go back to the older style and perhaps include the color tips on a separate page or on the actual color sample page. I have just canceled two pre-orders I had for Design Original books as I am unwilling to order them sight unseen at this point. Paper is medium weight, slightly rough, white paper (black backgrounds are printed on) and is perforated for easy removal. The paper is noted as archival-grade and acid free for 200 years. Alcohol and water based markers seep through the page and can mar the page below. Colored pencils work well with the paper. I was able to get good color, layer the same color and multiple colors, and blend easily using a pencil style blender stick. Hard lead pencils (like Verithins) can dent through the page to the page below. I like to use a blotter page of cardstock (or two pieces of heavyweight paper) below my working page to keep ink and pencil dents from marring the pages below. You can also remove the page before coloring to keep the rest of the book in good condition. I have read most of Susan Elizabeth Phillips novels over the years but my favorites have always been the Chicago Stars series. It has been a long time coming but, finally, there is a new book in the series. I can only ask Ms. Phillips – please don’t make us wait so long again. 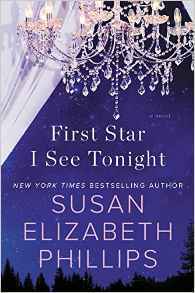 “First Star I See Tonight” has all the elements I expect in this series: a feisty, smart, witty and loyal woman to relate to, a gorgeous football player (in this case, retired football player), humorous situations, funny dialog, and a happy ending.